As an industry-recognized leader in the custom production and fabrication of custom gaskets and custom seals for over nine decades, Hennig Gasket has been delivering millions of custom gaskets and custom seals to virtually every industry sector, meeting or exceeding each customer’s most stringent requirements. One of the many areas that Hennig Gasket has developed an expertise in is flange gaskets. Whether it is a custom or standard flange gasket, ring gasket, or full face gasket, Hennig Gasket has the extensive in-stock inventory and knowledgeable engineering and production staff to produce the specific custom gasket or custom seal that is needed. In its simplest form, a flange gasket is used to join or fit between two sections of pipe; each pipe section typically has a flared area that provides a surface for the gasket to attach to. 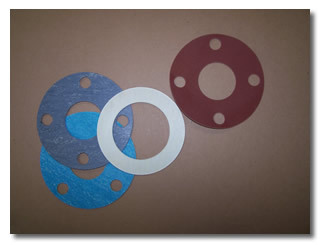 Types of flange gaskets include ring gaskets and full face gaskets. A ring gasket is a gasket with an inner diameter (ID) and outer diameter (OD); a full face flange gasket is similar to a ring gasket, with bolt holes (aligned in a bolt circle) in the surface area between the ID and OD. Both ring gaskets and full face gaskets come in metric and standard sizes, and in various thicknesses. Hennig Gasket specializes in the fabrication and production of custom flange gaskets, ring gaskets, and full face gaskets. The above table is just a small sampling of the types of materials available for the custom fabrication and manufacture of flange gaskets, ring gaskets and full faced gaskets. With full in-house engineering support available, Hennig Gasket can assist you with custom designing the flange gaskets that your specific application requires. From handmade specials made by our skilled craftsmen, to low-volume through high-volume production runs, Hennig Gasket can meet all your custom flange gasket needs. With over ninety years of experience in custom gasket and custom seal fabrication and hundreds of satisfied clients, Hennig Gasket can assist you with your unique specifications – give us a call or request a quote today!